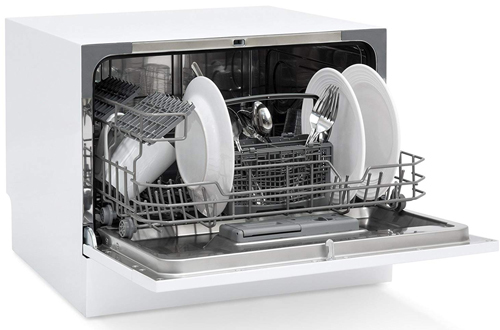 Do not let piling dirty dishes stress you when the HomeCompact Dishwasher can do the job for you. Featuring a compact footprint, this countertop appliance is perfect for small households and for single individuals. No tools are required to get started, the inlet and drain hose, faucet adapter that is compatible with the round-shaped faucet outlets. Plus, the aerators are removable. Another robust feature is the rinse aid dispenser that ensures your dishes are cleaned and dried without leaving any marks or streaks. The interactive control panel allows you to meet your varying dishwashing needs by toggling through the 6 wash cycles. It is pretty simple to use, you simply load the dishes in the cutlery rack and the dish basket. Doing dishes has gotten simpler and convenient with the EdgeStar DWP62. 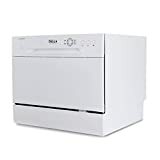 It is an excellent model that features a beautiful digital display that allows you to select from the 6-wash cycles. Most impressive, this dishwasher is energy efficient and uses about 61% less energy compared to regular models. Powerful spray arms deliver a clean and thorough washing. Built-in rinse agent dispenser prevents streak marks on your marks. Standing at about 17”, this unit features a compact footprint and can be installed in small cabinetry. Another major bonus feature is the quiet operation that stands at 52.3dB. It is perfect for use with plates that are up to 10.5” in diameter and features 7-wash cycles. Quick-connect adapter matches most standard sized kitchen faucets. This is another low-profile dishwasher from EdgeStar that can fit in small spaces while delivering a pretty decent job. On a glance, you won’t fail to notice the silverware basket and the cup tray that gives this unit an elegant look. You can comfortably toggle through the 6 wash cycles. At only 18” wide, EdgeStar makes a great option when you want to replace traditional dishwashers. Most adorable is the light indicator that notifies the user which wash cycle is running and a buzzer sound indicates the end of a particular cycle. The interior space is adequate enough to store up to eight dishes. If hand-washing dishes is not one of your favourite chores, the Best Choice Products Kitchen Countertop Dishwasher comes to your rescue. It also features a small footprint that can fit in most cabinetry and countertops. It boasts functional and easy to use controls that allows users to meet their dishwashing needs at a touch of a rotary cycle selector. More impressive is the preset start function that allows one to delay their washing between 1-24 hours. Apart from being portable, Best Choice also boasts a quality stainless steel interior and is ultra-quiet. Overall, it is a great option for us at home or in an office kitchen. This is another exemplary dishwasher that deserves an honourable place in your kitchen countertop. Boasting a low profile, it can fit most compact countertops. Most impressive is the fact that Danby Dishwasher is one of the top-rated energy-star compliant appliances. Plus, it is also great at conserving water and uses up to 3.1 gallons of water per wash. Nothing will prevent you from meeting your dishwashing needs, the 6-wash cycles allow you to achieve a thorough streak-free cleanup. Another reason why you may want to consider Danby is its exceptionally quiet operation that stands at 52dB. The interior is made of durable stainless steel. User interaction and customization is achieved through the electronic controls and the easy-to-read LED display. Quick connect feature allows this unit to be installed in most kitchen faucets without creating problems. If all you are after is convenience and ease of use, nothing beats DELLA Mini Compact Dishwasher. It is among the top favourite models known to deliver amazing results. With the easy to fill detergent and rinse aid dispensers, you can expect a thorough and mark-free cleanup. Installation is simplified with the included quick-connect kit that connects the unit to the kitchen faucet. Additionally, the control panels and the light indicators let you know which among the 6-wash cycles is running. Even more impressive, you can delay the start option by 2, 4 or 8 hours depending on your preference. The spray arm delivers impeccable cleaning performance for years. The interior is constructed of durable and quality stainless steel. 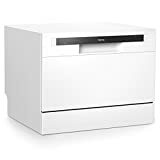 Overall, DELLA Mini Compact Countertop Dishwasher is suitable for small kitchens. 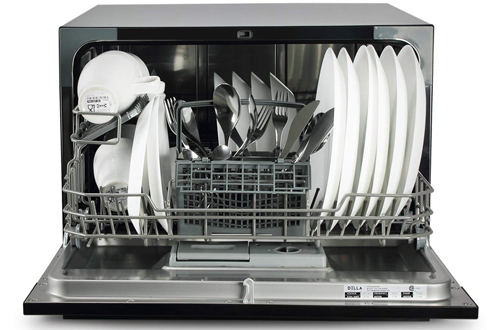 Despite featuring a compact design, the SPT Countertop Dishwasher boasts incredible power. It boasts a spacious cavity that can accommodate up to 6 standard place setting. 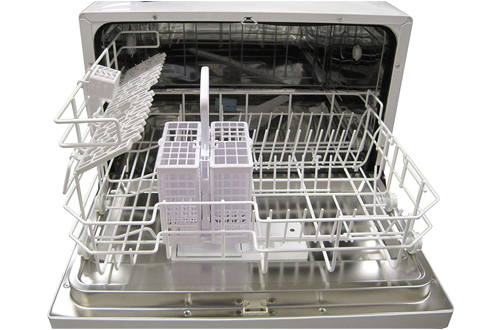 Moreover, the interior is made of superior stainless steel and can withstand temperatures of up to 148 degrees F. Friendly controls, automatic rinse agent dispenser and detergent makes your interaction with this dishwasher convenient and fun. For quick and simple installation, the faucet adapter is included in the package. Expect to meet your dishwashing demands owing to the 6-wash cycles. At 17.24” height, this low-profile dishwasher can be in smaller cabinetry and will fit in most countertops. 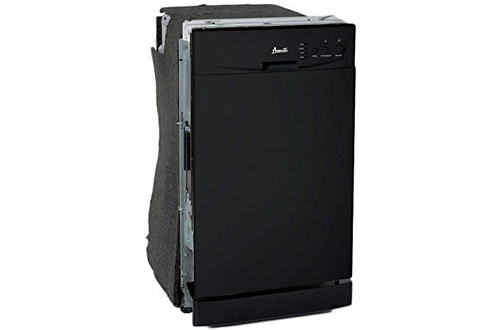 If you are after a more spacious dishwasher, the Avanti Full Console Built-in Dishwasher Avanti makes a great choice. With 8 standard plate setting capacity, this unit can handle more owing to its 4 automatic cycles compared to other models. It also features stain-resistant stainless steel interior and nylon-coated upper and lower racks. For thorough dishwashing, Avanti also boasts a three-stage filtering system and has a LED lights for seamless operation. The easy to use electronic controls makes your work easier. Other impressive aspects of this unit are the integrated recessed handle ADA compliant and the rinse aid dispenser that enables this dishwasher to perform incredibly well. Also, not that unlike other regular dishwashers, Avanti has a spray arm in each rack. Spice things up in your kitchen with the black Koldfront Portable Countertop Dishwasher. The 6-place setting unit will deliver a quick and clean wash saving you the hassle of spending more time in the kitchen. Low-noise operation stands at 55dB. Stainless steel interior is pretty durable and corrosion resistant. Under a normal wash, this unit will consume 3.5 gallons of water. Another impressive feature is the quick connect adapter that fits most kitchen faucets. 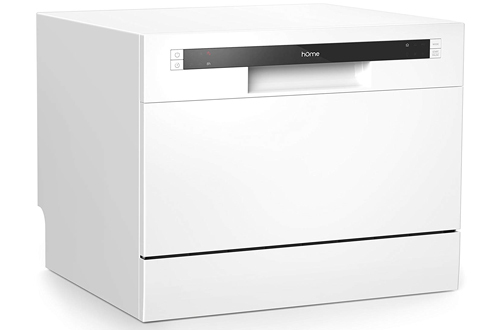 Standing at just 17inches tall, this low-profile countertop dishwasher surely deserves a place in your kitchen. 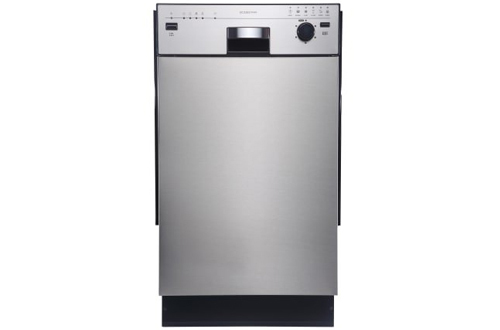 For a low-profile dishwasher that doesn’t require permanent installation, the EdgeStar DWP62BL makes a great choice. This portable dishwasher is a low-profile model that won’t give you a headache, in case you happen to have smaller cabinetry. 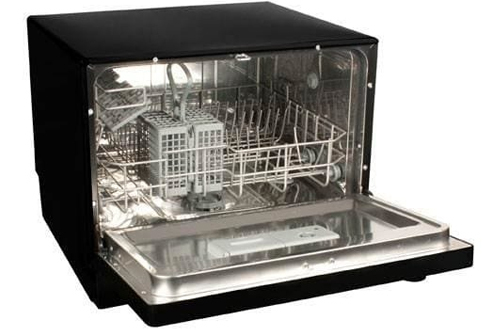 Plus, the dishwasher has a quality stainless steel interior for durability. It has a very low water consumption rate, standing at 2.85 gallons per normal wash. You can wash any plates that are up to 10.5” in diameter. Just like most models, EdgeStar DWP62BL features 6-place setting and include cup shelf, cutlery basket, and dish rack. It boasts a lower 52.3dB noise level. 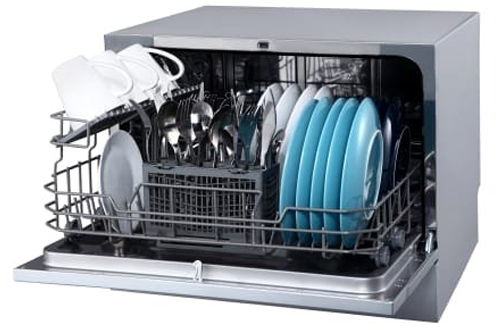 EdgeStar Energy Star 18” Built In Dishwasher- This Built-in dishwasher can fit in smaller spaces while still having enough interior space to accommodate up to eight 8 place settings. At only 18-inches wide, using this unit to replace an older appliance is considered a great option. Its interior features two pull out dish racks, a silverware basket, and cup tray. On the front of the unit, there is a selector that allows you to choose between six wash cycles. The unit is friendly and has a light indicator to show you which cycle is ongoing. It also ranks well in most stores online and has received an Energy Star rating for its efficient energy use. 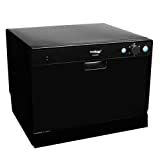 EdgeStar Energy Star 18″ Built-In Dishwasher- Compact and powerful, this six-cycle countertop dishwasher holds up to six standard place settings with 10 plates. 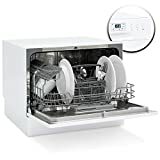 This dishwasher is designed from durable stainless steel and has a quick-connect adapter designed for most kitchen faucets. Standing just over 17-inches tall, this compact unit has a low profile that fits comfortably under most cabinetry without permanent installation. Additionally, the unit uses 200 kilowatt hours per year and 61% less energy when compared to other countertop units. 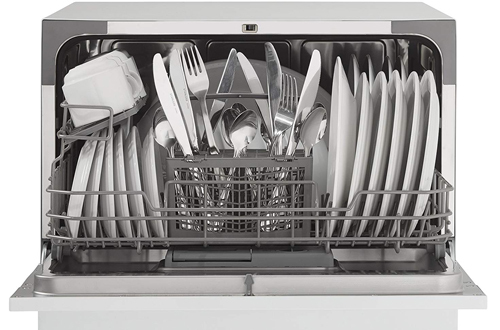 If you want a sleek, high-quality dishwasher, the GE GDF540HMFES fully integrated dishwasher is the product for you. While it isn’t quite as chic as the Bosch model, it is an extremely functional washer that offers a litany of different wash cycles. 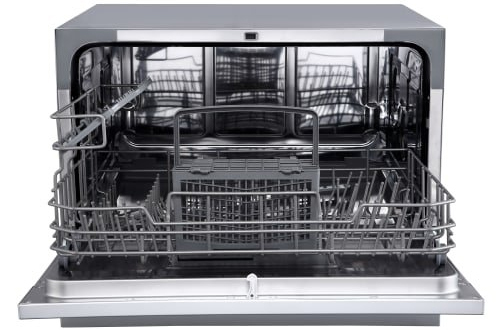 This GE dishwasher offers 67% more wash power to each rack that its predecessors. The customized racks are also removable creating a space for every dish, so loading becomes easy and more organized. This unit is sold at around $497, and it’s very efficient in any home setting. There are many options on the market, and you don’t need to break the bank to get great quality.